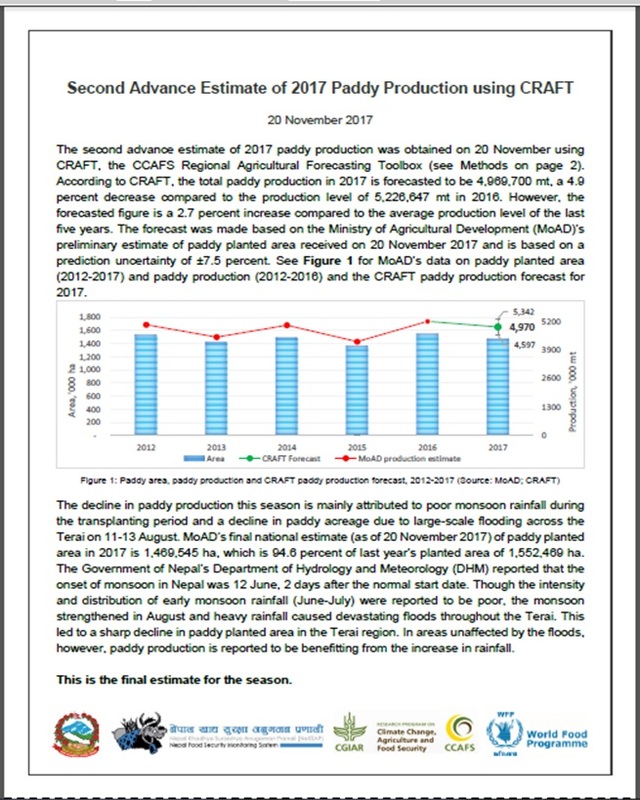 We are pleased to share the report, Second Advance Estimate of 2017 Paddy Production in Nepal using the CCAFS Regional Agricultural Forecasting Toolbox (CRAFT). This is the final advance estimate of paddy production for the 2017 season. This is a joint product of the Ministry of Agricultural Development (MoAD), World Food Programme (WFP), and the CGIAR Research Program on Climate Change, Agriculture and Food Security (CCAFS). The CCAFS Regional Agriculture Forecasting Toolbox (CRAFT) is being piloted as part of the Nepal Food Security Monitoring System (NeKSAP) and is a new initiative to incorporate crop yield forecasting in Nepal with technical support from CCAFS South Asia.